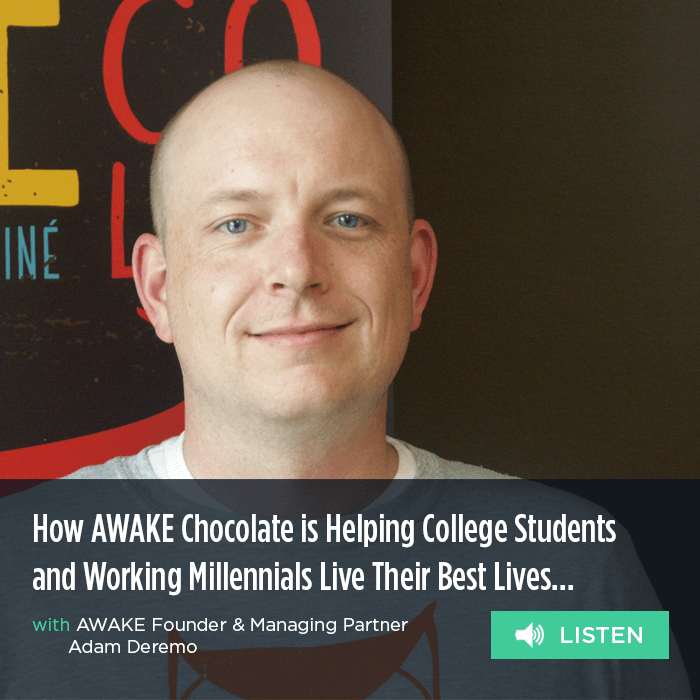 This week we’ve got Adam Deremo, founder & Managing Partner of AWAKE Chocolate. Launched in 2012, AWAKE make great-tasting caffeinated chocolates. They’re all about providing consumers with a quick, easy – and delicious – energy boost to help them get the most out of their day. One of their bars has the same caffeine as a cup of coffee. One of the unique things about AWAKE is that Adam and his cofounders have a history in big, traditional CPG. He talks about how this experience has given them a competitive advantage as they’ve built their brand. Awake also has a unique channel strategy. They’ve made a point to really hone in on point of consumption and work their way outwards. In fact it’s how they landed on two of their most successful channels. Another big theme with AWAKE – testing and learning… Adam and the team do a great job taking customer feedback and iterating, to keep pace with their consumers, something that every brand out there can apply to their business. We spoke to Adam about all this, plus the origin of Nevil, the brand’s official spokes-owl.